I'm helping my brother and his fiancée plan their wedding in Seattle, but I live in Los Angeles. I was hoping you or some of your wonderful readers might have some help for me. They are planning a *super* low budget (go figure, they'd rather spend their money on their future together! :) ) and about 50 people. We also love the idea of a "retreat" wedding, where the wedding, reception, and lodging can all be in one lovely, homey place where we call all hang out and celebrate their love! Um. I hope by lodging you mean c-a-m-p-i-n-g. Unless anyone has a better suggestion? A cabin retreat may be a good idea. The Seattle area should have plenty of beautiful camping sites with cabins. Retreat centers are a great option, thats what we rented for our wedding. They usually have some kind of function room for a reception, sleep large groups on the cheap, and are in beautiful locations. Maybe google "retreat center" or "conference center" in Washington. ask someone random with a sweet backyard barn to rent it? i want a barn wedding in the worst way. is that over? 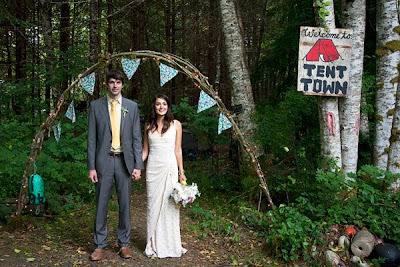 some good friends of mine got married over NYE where they went to camp when they were children. precious. yeah, what anna said. they have tons of retreat or conference centers at camps around the country, usually used to teach kids about nature, etc. the rooms look like tiny, no frills dorms. i think that would be perfect. it's like camping, but all your guests don't have to pitch a tent. No, but seriously, Olympic National Park, dudes! It's some of the best camping in the country, plus you get Peony Love-esque beachy photos. I don't know about a place to stay, except for the Ace.. which is always awesome. But for the night before, for a fun night out, go to The Can Can!! I spent NYE there, and it rocked!!!! If you don't want to camp, try the Andersen Lodge. its a bit of a drive from seattle but you can get the place for up to the whole weekend and there are dorms and such for all the guests. Mountain Springs Lodge is also gorgeous! Not as beautiful/swank as "Treehouse Point" .. but it's absolutely gorgeous out in the Leavenworth area and would be a gorgeous fall "retreat" wedding. Go for a sprawling ranch with a huge house that you can magically fit everyone in. I also really love the idea of a treehouse. But I am just fantasizing at this point. Thanks everyone so much for your input! I knew you all would have great ideas! Washington State sure has some awesome natural beauty to choose from! I am totally into the camping (or c-a-m-p-i-n-g) idea, but I am assuming that there may be some elderly people invited who may not take to well to sleeping on the ground - not because they're grumpy but because they can't. In which case a facility with a both camping and cabin options would be great. But i also loooove brideonashoesting's idea of an old house (or barn). That way if the young-ins want to camp they can! I wanna hear more about this wedding, please. Yes- I have to agree with the above suggestion Kitsap Memorial Park Baby! We shot a wedding there and I called it our "Robin Hood Wedding". Other options...I love Doe Bay up in the San Juans Islands. Very Chill. You could also check out For Flaggler Park and Fort Worden. Click on my name and it will take you to photos shot at Memorial State Park! Sean Flanigan just recently featured a wedding from there on his blog as well. 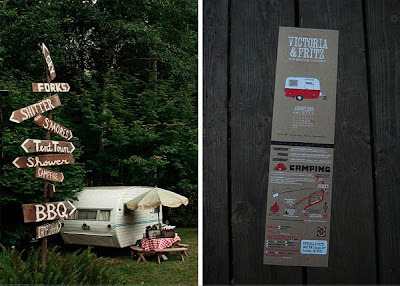 I'm having a "camping" wedding, though at my own summer cabin & (hopefully) with fancy bell tents set up for overflow. I'm also sending a list of local b&b's for older guests, or those who don't feel inclined to outhouses. perhaps an early fall wedding when you can borrow/rent something like this - much much more budget friendly than a lodge or real retreat.